The Multisensor measures temperature and brightness in a room and receives the infrared commands from a remote control (RC5-Code). It passes these data and signals of the Multisensor - Inputs (for push buttons, PIR etc.) on to the Multisensor-Receiver. 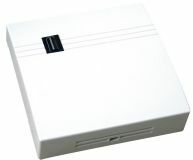 The multisensor will be installed on the included in-wall-box at a height of 100 till 150 cm. It should not be affected by direct solar radiation. Furthermore it should be placed as far away as possible from potential heat sources (to avoid effects on the temperature measurement). temperature measurement can possibly be changed.